Creek View Dental is a family-friendly dental practice that has a warm and inviting environment. Step into our comfortable and caring dental office and enjoy warm greetings from our knowledgeable and friendly dental team. We are committed to patient communication and constantly strive to fully understand our patients’ needs. By offering a wide variety of dental services, we help all our patients enjoy positive oral hygiene health for many years. Getting regular dental checkups ensures that we can help you have a healthy smile. By coming to Creek View Dental for your regular checkups, we can prevent future problems by detecting issues such as tooth decay and gum disease before they become severe. When Dental Help is Needed…Creek View Dental is Available! Sometimes, even with the best oral hygiene habits and practices, dental problems still occur. If that happens to you, Creek View Dental will treat the issue efficiently and effectively. We want to get you back on the road to a pain-free, healthy smile as soon as possible! Our dental professionals believe that in any successful relationship, there is communication. They strive for openness and clarity while communicating with you and will fully explain each of the treatment options available. Creek View Dental welcomes your inquiries and comments! We promise to do our very best to respond quickly and fully to any concerns you might have. We want to become a dental office that you will gladly refer to friends and family! 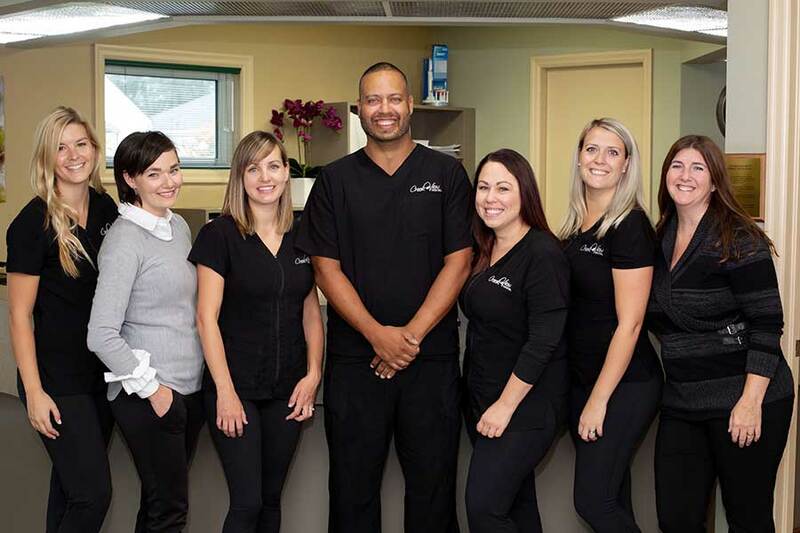 Our professional staff are all highly trained and qualified in the latest dental industry advancements to serve you in the best way possible. Besides regular check-ups, our office offers: digital x-rays, white fillings, root canal therapy, dentures and oral cancer screening. We work closely with you to ensure you have excellent oral health for life! Looking for Cosmetic Dentistry Services? When looking for an office that completes cosmetic dentistry, Creek View Dental is your answer! Besides completing bridges, crowns and veneers, we also complete implants. White fillings are made to match your existing teeth so that you will leave our office with a smile that’s clean and natural. Life is busy these days, so we do our best to make your dental visits as easy as possible. Located conveniently on Martindale Road in St. Catharines, our office has plenty of free parking. With hours that range from early morning to late in the evening, five days a week, Creek View Dental’s office staff will find a convenient time that meets your family’s scheduling needs. We are now accepting new patients and would love to welcome you and your loved ones to the Creek View Dental family! Contact one of our friendly receptionists today to set up an initial appointment. We look forward to meeting you!